Still at SG of 1.018, so I racked onto 1 1/4 tsp. of potassium sorbate and 1/4 tsp of potassium metabisulfite, enough of each for 5G by the package directions. I’ll be able to bottle in 3-4 days. Don’t plan on back-sweeting. The whole point was to use enough honey that fermentation would finish with a high SG. Did I mention it already tastes quite good? Braggot #2, the “burnt” braggot, is at an SG of 1.016. Still unsure how palatable this on is/will be; I may just end up reclaiming the 3G carboy and 1G jug. The Hefty Braggot measured 1.021, and is still bubbling lots of little bubbles. But from testing a drip, the taste doesn’t seem all that sweet. Measured SG now at 1.016. So though it is not bubbling visibly now(! ), it is appears to still be active. I measured an SG of 0.999. But the stuff is still bubbling slightly! I want to start towards bottling this one, but guess I will give it some more time. Measured blackberry wine with an SG of 0.993. After racking off lees, adding water, I measured the SG again and found a 0.995. I imagined there would be a measurable difference, due to the amount of water added – water being denser than the current solution. The blueberry wine has an SG of 1.070, almost unbelievable. At first I considered that it might be because of the large upstream of bubbles, but that doesn’t seem possible. It has seemed to be fermenting strongly (lots of bubbles) though it was one that seemed to be very sweet after primary fermentation as well. The melomel of blueberry measured at 1.014. After racking and topping up with water, it was more like 1.012. Still makes sense since water has a lower density than the 1.014 solution. So the pattern seems to be that the blueberry batches are taking longer than the other ferments started at the exact same time (the cherry and the blackberry). Not sure why the blueberry wine is so far behind its partner, though. It seems to still be fermenting. I may need to check on the pH and/or add some more yeast nutrient or something. The porter is at an SG of 1.022, so still some way to go! Stirring for the first time after the day I pitched the yeast. You can see it foamed vigorously. The plum now measures and SG of 1.021. The recipe said at 3-4% PA to rack, and it is not quite there. But then again, I put much more sugar in, so it has really already handled that level of sugar. I racked the plum to a 3G carboy. Looks like I may actually have another gallon of liquid, which is not good when taking into account the amount of sugar I expected. That will likely throw things off a bit. And I’m not sure what to do with the remaining liquid, since there is so much! Note the color is very “bubble gum” – a deeply opaque pink. But not quite Pepto Bismal pink. 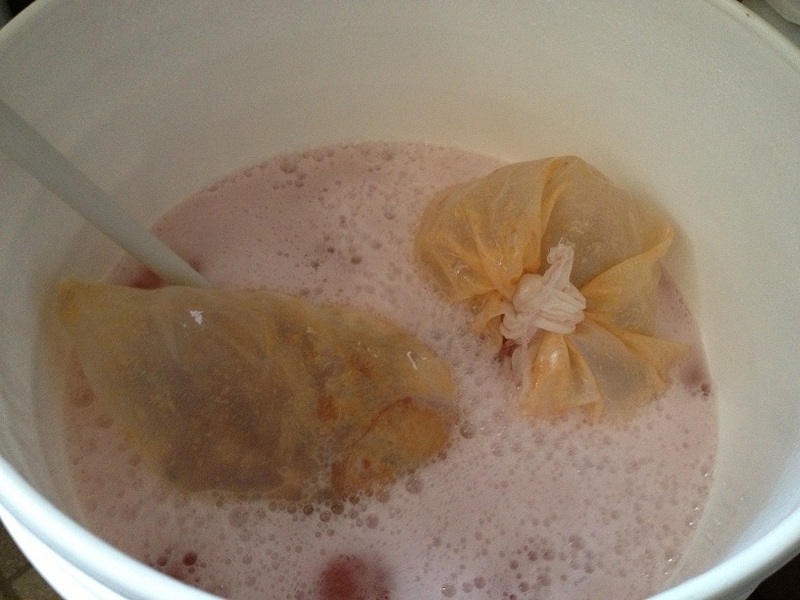 Around 9PM, returning home from a birthday party, I found out that it had been over-foaming into the airlock, which was now a solid whitish-pink color. I cleaned it out, replaced and watched the airlock for a bit. I ended up doing this a couple times before the fermentation settled down enough to not be shoving bubbles up the air-lock tube. So that is it. Lots of activity. Concerned about the blueberries. They just aren’t acting as I expected. Most of the ones I racked last Sunday have given me some pause. In each case, I sanitized equipment with Star San, and for days had little bubbling after the racking. It was nearly weekend before I could clearly say the blueberry was back bubbling. The cherry and blackberry still show no signs of bubbling, but one can’t expect them to do much more with an SG of 0.995! I guess those two will be candidates for bottling here soon. The hefty braggot has yet to visibly bubble again. But it seems to be still at work, so maybe the 5G carboy is just providing more space for the CO2 to be caught in solution. And I didn’t notice any lack of bubbling with the plum wine, which aggressively bubbled. I sanitized in the exact same fashion. Probably just worrying too much. Things seem to be working fine. 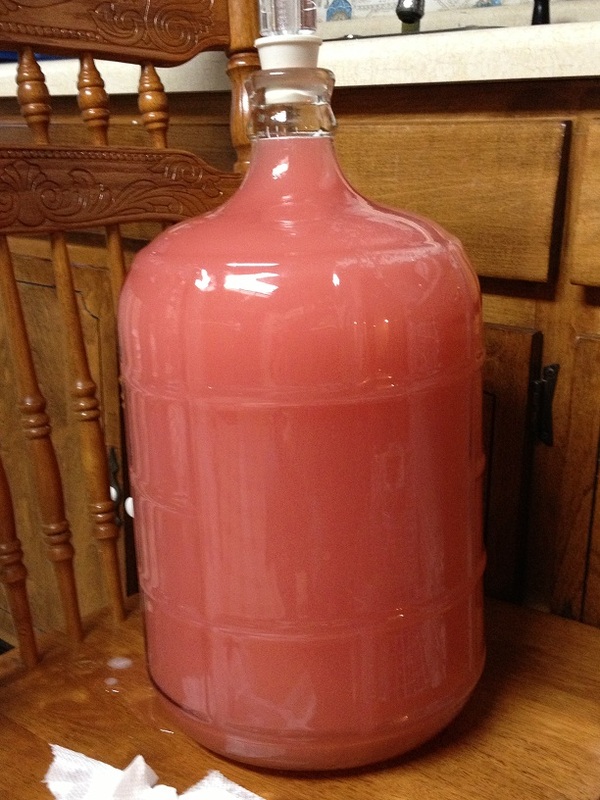 This entry was posted in Fermentation Log and tagged blackberry, blueberry, braggot, Cherry, Mead, plum, strawberry, Wine. Bookmark the permalink.